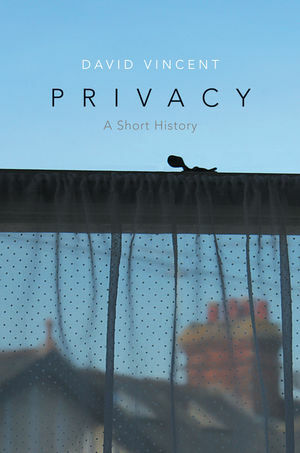 Privacy: A Short History provides a vital historical account of an increasingly stressed sphere of human interaction. At a time when the death of privacy is widely proclaimed, distinguished historian, David Vincent, describes the evolution of the concept and practice of privacy from the Middle Ages to the present controversy over digital communication and state surveillance provoked by the revelations of Edward Snowden. Deploying a range of vivid primary material, he discusses the management of private information in the context of housing, outdoor spaces, religious observance, reading, diaries and autobiographies, correspondence, neighbours, gossip, surveillance, the public sphere and the state. Key developments, such as the nineteenth-century celebration of the enclosed and intimate middle-class household, are placed in the context of long-term development. The book surveys and challenges the main currents in the extensive secondary literature on the subject. It seeks to strike a new balance between the built environment and world beyond the threshold, between written and face-to-face communication, between anonymity and familiarity in towns and cities, between religion and secular meditation, between the state and the private sphere and, above all, between intimacy and individualism. Ranging from the fourteenth century to the twenty-first, this book shows that the history of privacy has been an arena of contested choices, and not simply a progression towards a settled ideal. Privacy: A Short History will be of interest to students and scholars of history, and all those interested in this topical subject. DAVID VINCENT is Professor Emeritus and former Pro Vice Chancellor at the Open University, UK. "Forget what you think you know about privacy. In this vivid, discerning book ranging from the 14th century to yesterday, David Vincent knocks over much of the received wisdom about this hotly-debated concept. Privacy is not now dead nor was it invented in the eighteenth century. An original and important synthesis." "Those who think privacy is a modern luxury, and those who predict its imminent extinction, will each have their certainties questioned by this wise, deft and well-referenced history." "From the crowded tenements of the Middle Ages to the eternal Panopticon of the internet, David Vincent deftly examines the social, political and technological determinants of privacy. This is essential reading for all those interested in privacy."